The story of the bluesman, the Devil, and the deal at the crossroads, as retold in Stephen Davis’ Hammer of the Gods. In the delta of the Mississippi River, where Robert Johnson was born, they said that if an aspiring bluesman waited by the side of a deserted crossroads in the dark of a moonless night, then the Devil himself might come and tune his guitar, sealing a pact for the bluesman’s soul and guaranteeing a lifetime of easy money, women, and fame. 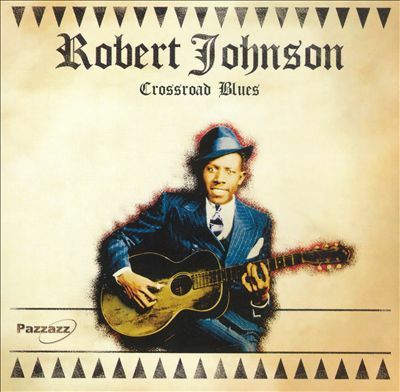 They said that Robert Johnson must have waited by the crossroads and gotten his guitar fine-tuned. Robert Johnson was a Mississippi blues singer and songwriter, who according to legend, sold his soul to Satan “at the crossroads” in exchange for his remarkable talent on the guitar. Born and raised in Mississippi, Robert Johnson started playing blues guitar in the late 1920s. His wife and child died in childbirth around 1930 and he is said to have devoted himself to the guitar. Part of the crossroads story comes from a report that he dropped out of sight for a while in the early 1930s and returned a much-improved guitarist. In 1936-37 he recorded at least 29 songs in Texas (San Antonio and Dallas), then returned to Mississippi to play and sing in clubs and bars. His mysterious death at the age of 27 added to the legend: He died in 1938, falling ill after playing a party and dying four days later. Undisputed facts about Johnson’s life are few and far between. More often than not, his legend has obscured the few grains of truth that can be discerned. According to the myth, the young bluesman desperately longed for fame and fortune. At the stroke of midnight, he walked down to the windswept crossroads at the junction of Highways 61 and 49 in Clarksdale, Mississippi. Reciting an ancient incantation, he called upon the Devil to make his deal. In exchange for Johnson’s immortal soul, the devil tuned his guitar, thereby giving him the abilities which he so desired. From then on, the young bluesman played his instrument with an unearthly style, his fingers dancing over the strings. His voice moaned and wailed, expressing the deepest sorrows of a condemned sinner. Whatever the reason, Johnson died at the young age of twenty-seven, and left a legacy of Delta Blues music that has influenced guitar players like Muddy Waters, and his songs have been covered by several rock stars, including Eric Clapton and The Rolling Stones. Because of the historical significance of “Cross Road Blues,” it was inducted into the Grammy Hall of Fame in 1998.